Never have I been so disappointed on entering a building as I was when Cate went inside the National Branch. Rather than a bank filled with all sorts of stealable valuables, it turns out instead to be Scientology Central where the head of the Fellowship, Batlin, lives. 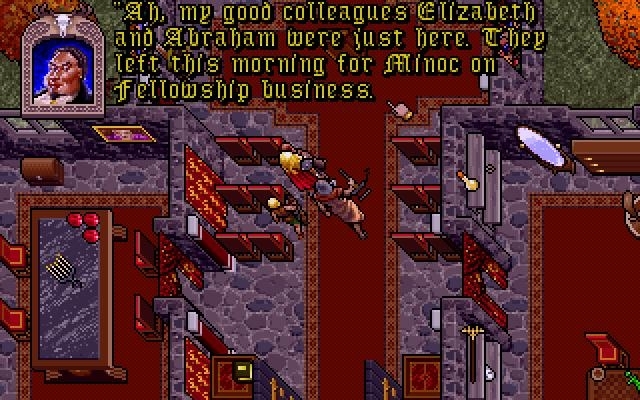 Talking to him is predictably boring, but Cate does get one useful bit of information: Elizabeth and Abraham, two cultists – can I call them cultists yet? – who deal with the organisation’s money and who were up to entirely unsuspicious activities in Trinsic the night before the murder, have passed through Britain en route to somewhere else called Minoc. Next stop Minoc then, I guess.